Recyclers in Europe are keeping watch on how China’s ban on imports of waste plastic, and politicians’ response to the problem, will impact their business. European business manager, said that while at Fakuma, he has spoken with representatives from various carmakers. They believe the European Union is getting ready to announce new legislation mandating the use of recycled material in new cars. It estimates that if the EU requires 10% of automotive plastics be made up of recycled material, that would require 30 million metric tonnes of high-grade recycled plastic to achieve this target. There is no way the industry can handle something along those lines. One of the company recycles batteries and recovers the lead and polypropylene. On the plastics side, it produces PP, a recycled product described as having the same characteristics as virgin material. While the wider automotive industry braces for possible new regulatory guidelines, the decision by China to close its doors to imported plastic waste has had little impact on the direction taken by other European recycling industry. For example, one of the recyclers has recently developed a new solvent-based recycling process. It preserves polymer chains and results in an improved recycle. The company would be moving ahead with plans to increase its European recycling capacity regardless of the decision made by China. Two years ago, other companies were looking at us and saying that this solvent-based technology was not necessary. They believed conventional recycling was enough. But the new technology is developing to designed to help worldwide. He added that the technology has attracted a series of chemical companies interested in partnering the recycling industry to help improve process efficiencies and increase percentages of recycled material. APK now plans to open a second, 30,000-tonne-per-year recycling plant. Would the company have considered doing this if China had not closed its market to plastic waste imports? “The Chinese decision had no effect on our strategy; it’s completely separate,” he said. 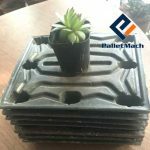 The process of the pressed plastic pallet is very simple. 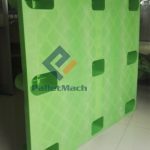 You not only can recycling plastic waste, but also can get the new plastic pallet. 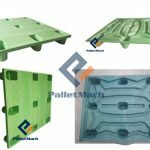 Besides, the broken plastic pallets also can be processed into the newly pressed plastic pallets. 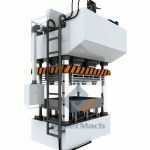 Plastic pallet making machine is the ideal machine to recycle waste plastic. And plastic pallet making machine is changing the waste plastic into the plastic pallet, so it helps to protect the environment. There is no manual operation in the process, which realizes the automatic control with long-term, stable, effective. It also makes the pallet making process more stable, and realizes fine work of production. The price of the raw materials is less than 50%, so the investment is also lower than 50%. In addition, the technology process of plastic pallet making line is easier, and easy to operate. The quality of the final pressed plastic pallets is as good as the traditional ones. Meanwhile, the final pallets are one-piece design, which is saving space 60% than the traditional ones. 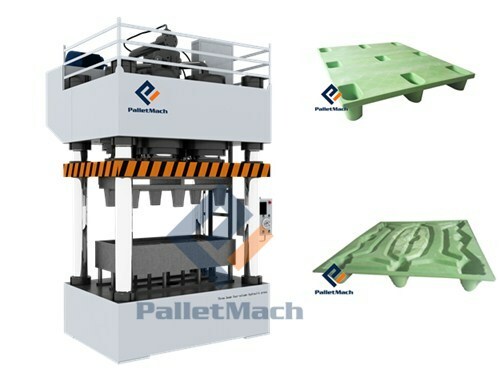 If you have any question, please email us sales@palletmach.com.